2013 album from the country music legend. 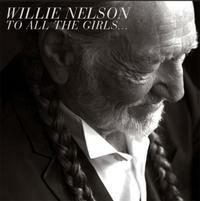 To All The Girls... finds Willie reunited with his two greatest loves: beautiful music and talented women. Decades of heartfelt performances and compositions in popular music have long solidified Willie's reputation as one of country s greatest romantics. To All The Girls...continues Nelson's musical relationships with some of the most talented women in country, pop and soul. Includes appearances from Dolly Parton, Mavis Staples, Sheryl Crow, Carrie Underwood, Emmylou Harris, Alison Krauss, Miranda Lambert, Norah Jones, Loretta Lynn and Roseanne Cash. To All The Girls... reunites Willie with producer Buddy Cannon, who worked with Willie on his most recent successful releases, Heroes and Let's Face The Music And Dance.